Loretta (Vida) Atkinson died Aug. 22, 2018, at age 92, at Rose Arbor Hospice in Kalamazoo, MI. Loretta was born August 6, 1926 to parents Joseph and Genevieve Wajda (Vida), who had emigrated from then-Austria (now Poland) to Detroit in 1907. Loretta was youngest of nine children, and the last survivor of her generation. Loretta was officially a World War II veteran, having entered the Armed Forces nurse's training in 1945 prior to the end of the war. She completed her training in 1948, and worked as a registered nurse throughout her adult life, in private practice, hospital and later private duty environments. She managed the Oakland County (Michigan) Private Duty Nurse's Registry for a period. Loretta met her husband-to-be James (“cute and tall”) at their church young adult's social club in the early 1950s, and they were married in Feb. 1953. They remained married and committed to each other throughout their shared lives. 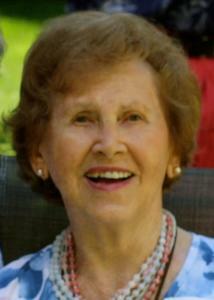 Loretta and Jim had four children: Bill (Karen), Bob, Susan (Rick), and Dan (Alysia); nine grandchildren: Lauren and Michael Starrett, Samantha and Trevor Atkinson, Gregory, Christopher and Erin Atkinson, Aimee and Benjamin Atkinson; and two great-grandchildren: Landon Atkinson and Daisy Hindman. Loretta was a loving and devoted mother to all. Loretta was a highly creative person with a discerning eye for the arts and a passion for music. Blessed with a real talent as a vocalist, she sang opera early in life, then with church choirs through her middle years. She loved to paint, and produced paintings and decorative objects that now adorn her own home and those of her children and grandchildren. As a member of the Ladies Library of Kalamazoo, she successfully secured a grant to clean and restore the organization's artworks and actively supported their Books for Babies group. She supported other efforts and organizations that educate, feed and protect children.